It was pretty easy to click the box that asked if we wanted to sign up for text message alerts if anything came up on our Southwest flights to and from Las Vegas. We are usually skeptical of getting text messages from our travel partners, but decided to it was easy enough to try it this once. Did it pay off? Well, sort of. We did receive an alert, after we had already arrived at the Las Vegas airport for our return trip that let us know that our 9:50 a.m. flight was delayed until 11 a.m. Not a huge deal breaker, but enough to make us wish we had skipped an airport breakfast in favor of an airport early lunch. Shortly after the initial text, we received another one letting us know that our flight was once again “delayed” but this time, back to the original time of 9:50 a.m. Good news overall, if not a little weird. 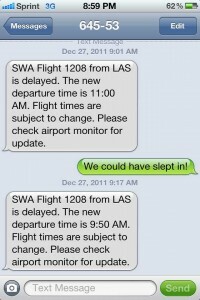 But I can’t blame the text messages – Southwest had in fact changed the flight time twice due to the ever-changing fog conditions in San Francisco, and the departure displays reflected the same information. Overall, it was helpful to get the updates without having to leave our seat with pretzel in-hand. Thanks to Southwest for making it easy enough to sign up and receive the text message alerts keeping us current on all flight news.